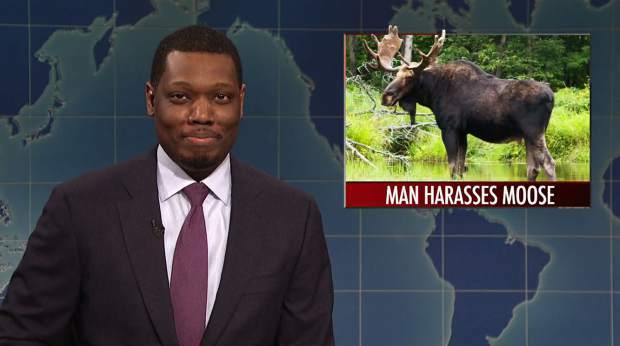 Comedian host Michael Che tells a joke about an incident involving a moose on Saturday Night Live’s Weekend Update, which aired Saturday on NBC. Three human-and-moose interactions that surfaced on social media last weekend — and have received national attention since — remain good reminders that however gentle the wild animals may appear to be, people would be smart to keep their distance. The three social media posts — two videos and still images — show three recent but separate incidents involving moose in Summit County that authorities say weren’t just unwise but could be illegal. In fact, one woman who recorded herself feeding a moose from her car window was cited. On Sunday, a spokesman with Colorado Parks and Wildlife confirmed they still have not been able to identify the man shown in a video shot about four weeks ago in Frisco’s Drake Landing neighborhood. In the video, the man stands dangerously close to a moose, and at one point, the moose appears to kick the man. People warn him to “back off, buddy,” but he doesn’t seem to heed their advice. 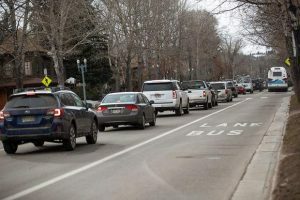 In a third Summit County moose incident, another man allegedly chased one around downtown Frisco before a passerby snapped a photo of him standing next to the moose in the median of busy Highway 9. The local story, along with the other two, made statewide news before going viral and has now even landed a brief appearance on Saturday Night Live’s Weekend Update on NBC. It was a brief mention — only about 10 seconds setup to punch line — and one of the hosts of the popular spoof newscast, comedian Michael Che, actually misreported the case in relaying the joke. He said authorities were looking for the man accused of chasing a moose around downtown Frisco, but local police and state wildlife officials identified the individual almost immediately after the photo of him and the moose, which looked agitated, started making rounds on social media last week. Wildlife authorities held off charging the man, in part because he had been displaying erratic behavior throughout the day, including his alleged actions with the moose, and the investigation into his behavior was ongoing, they said. That didn’t keep SNL’s writers from taking a somewhat crude and sexist stab at the story with Che teasing: “Said the man, ‘I like my girls thick,'” before segueing into another bit about Rudy Giuliani. If anything, moose, the largest species of deer, are thick. In fact, a full-grown female can weigh 800 pounds or more, about the same size or slightly smaller than a full-grown bull elk. An adult bull moose can weigh 1,300 pounds or more. For people and the animals’ safety, Yellowstone National Park warns its visitors to keep at least 100 yards away from predators, such as bears and wolves, and at least 25 yards away from other large game animals, like bison and elk, at all times. According to the Wilderness & Environmental Medicine journal, it’s far more likely someone will die as a result of an incident with hooved livestock, a bee sting or dog attack, but that doesn’t mean that there haven’t been documented attacks by moose, as rare as they may be. Captured on video, a woman in British Columbia, Canada, was briskly walking past a grazing moose in her town — a place where encounters are a part of everyday life — when the animal stopped what it was doing, followed the woman a few steps and then kicked her hard high in her back or the back of her head, seemingly without provocation. The woman suffered only minor wounds in the strike, but that wasn’t the case for a partially blind 91-year-old man killed by a moose while walking to church in Grand Lake in March 2006. After authorities euthanized the animal, they discovered it had had been seriously injured in a previous incident — likely a vehicle strike — and theorized the great amount of pain the animal had to be in might have contributed to its aggressiveness toward humans. Aggressive moose are nothing new, and incidents, while extremely isolated, have been reported across the country, as moose do inhabit much of North America. In January 2017, two moose attacks happened in back-to-back days outside Ogden, Utah. The same cow caught on video charging a group of hikers on a Saturday was blamed for a Friday night attack on two men on snowshoes. One month later, after triggering an avalanche, three snowboarders reportedly fought off multiple charges outside Aspen by the same aggressive moose as they waited for help. The actions of the Summit County woman who recorded herself feeding the moose were especially troublesome for authorities because feeding wildlife only invites human-and-moose interactions, they say. Even if feeding the moose doesn’t turn sour, wild animals can grow accustomed to, even dependent on people and later become aggressive toward them. When animals start becoming aggressive toward people, wildlife officials often have to put that animal down. Anyone with information about the man shown getting kicked in the video is asked to call Operation Game Thief at 877-265-6648 and can remain anonymous. 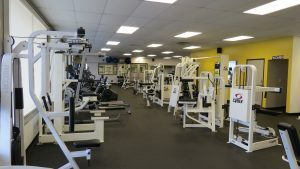 Rewards are available if the information leads to an arrest or citation.